Pennsport is a historically Irish-American neighborhood in South Philadelphia. It is bound by Washington Avenue to the north, Snyder Avenue to the south, the Delaware River to the east, and Sixth Street to the west. Known for being a relatively quiet neighborhood with historic significance to the city, Pennsport is home to local gastropubs and famous eateries such as Federal Donuts. Second Street, known locally as Two Street, is home to the Mummers organization, famous for conducting the Mummers Day Parade on New Year’s Day. 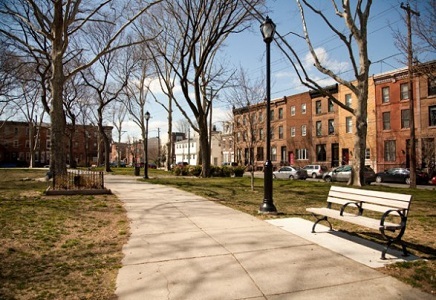 Pennsport’s tree-lined scenery and Dickinson Square Park provide opportunities for families to enjoy outdoor recreation in the neighborhood. The neighborhood’s close proximity to the I-95 expressway makes it the ideal neighborhood for those who commute by car. The median sales price per home is $252,500 with a price per square foot of $230. The median rent per month is $1,575.